Stop active and passive voice in verbs from stumping your students! 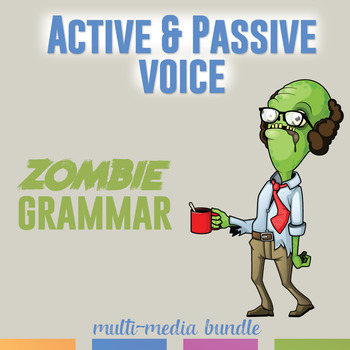 This multimedia bundle includes a grammar video to teach active and passive voice, plus practice activities. I made this grammar video and the activities for older students. I also use these activities when I review for standardized testing. ★ A student sheet for taking notes during the video. 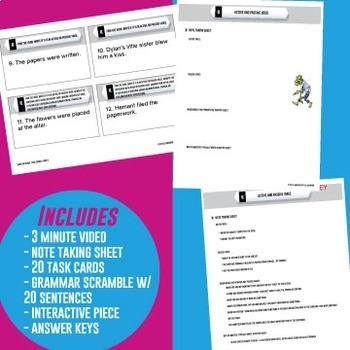 ★ 20 task cards with practice sentences. 10 sentences allow students to practice identify verbs in active and passive voice. 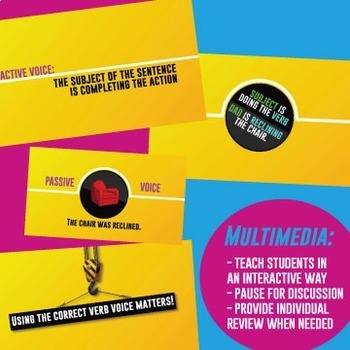 10 sentences ask students to identify verb voice, and change passive voice to active voice. A student answer sheet for writing is included. ★ 20 sentences in a grammar scramble. Students must 'unscramble' the sentences into passive and active voice. A student answer sheet is included. ★ An interactive notebook piece. ★ 5 sentences on an exit ticket. Use this as a quick assessment. ★ An answer key for all activities (editable format). 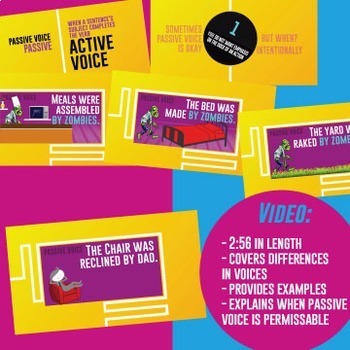 Make life easier while teaching students active and passive voice in verbs with this grammar video and accompanying activities.